Hi there Gals and Guys! I have something super exciting to share with you today! I've been waiting for this for quite some time, but I was sworn to secrecy until now! Today is the piCture pOlish Blog Fest 2013 and I was invited by piCture pOlish to be a part of the fun this year. :) I am so excited to be able to finally share this manicure with you all. I am terrible at keeping secrets, but somehow I managed. piCture pOlish sent me 3 shades to make into my most "amazing nail art manicure ever." The shades they chose for me are Watermelon, Mad Magenta and Wisteria. I think someone at piCture pOlish knows me well because these shades are perfect for me! I absolutely love all three of them. 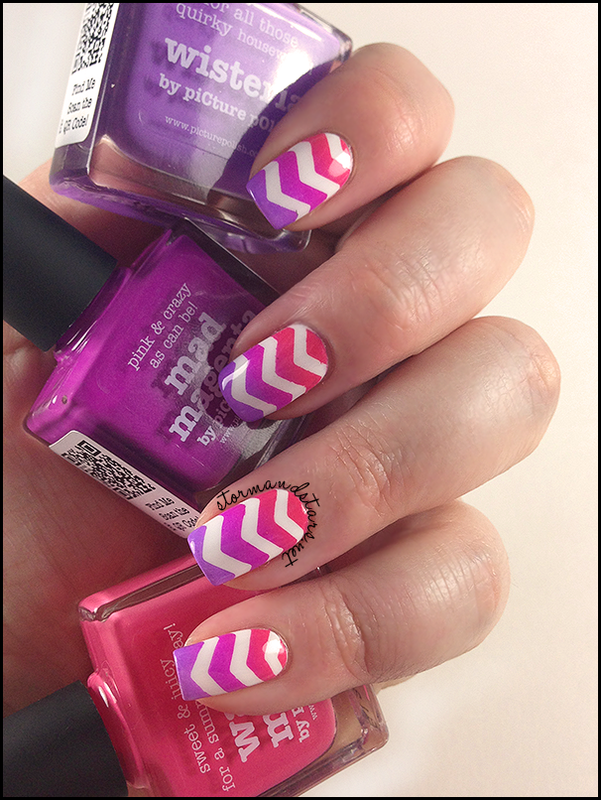 So without anything further, here is my nail art for the piCture pOlish Blog Fest 2013! I love love love how this manicure turned out! The colors are so perfectly summer and they really are very me. The three shades sent to me by piCture pOlish were just crying to be turned into a gradient. They flow into each other so well. I can assure you this won't be the last time I use them together in a gradient. The formula on the three shades was creamy and perfect. I swatched them all on sticks before deciding on nail art and I can confidently say they practically paint themselves on. piCture pOlish lacquers can be found on their Website or at any of the retailers on their Network Page. Please see the piCture pOlish Shipping Page for more information about local and International shipping. Don't forget to also check out the Everyday Deals Page to make sure you care getting the best deal on your polish! Click one of the links below to go to the various piCture pOlish social media pages. 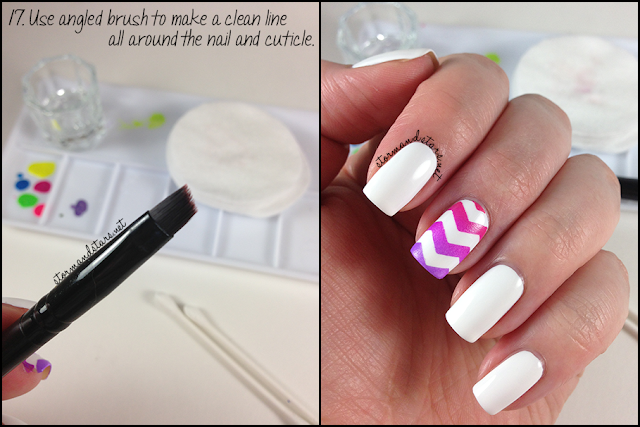 Now that you have seen the manicure, do you want to see the tutorial? Please click on Read More below to see the full step-by-step picture tutorial. I'll have simple steps on the images themselves, but will go into more detail in my text. I hope you enjoy! First up I'd like to show you the supplies and materials I used to create this look. 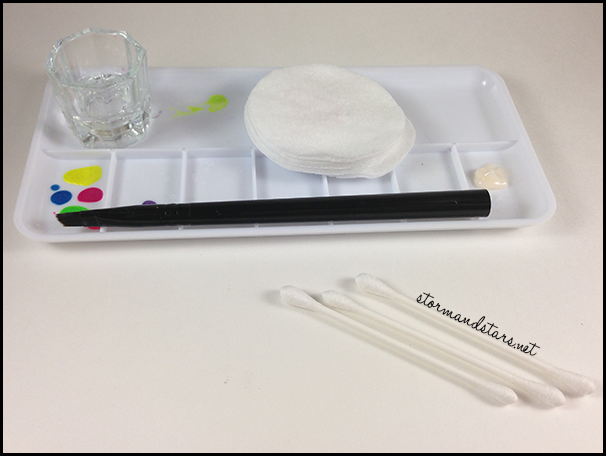 Toothpicks, polish for gradient, fastdry topcoat, basecoat, white polish, tape, cleanup brush, zig zag craft scissors, q-tips, make-up sponge, cotton pads, a sheet of plastic and acetone in a small dish. Not pictured is my lotion. 1. Make sure your nails are clean and dry. 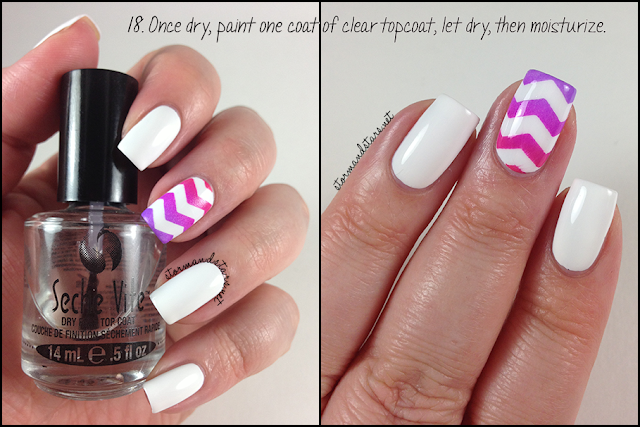 Paint on 1-2 coats of your favorite base coat or nail strengthener. I use OPI Nail Envy, but you can use anything you prefer. 2. Once your base coats are dry, paint on 2-3 coats of your favorite white or off-white shade. 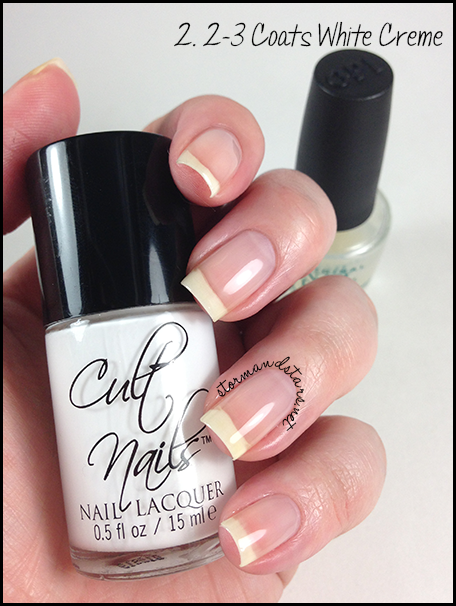 I used Cult Nails Tempest for this manicure, but you can use any white shade that you prefer. 3. Paint on one coat of a fast-dry topcoat. 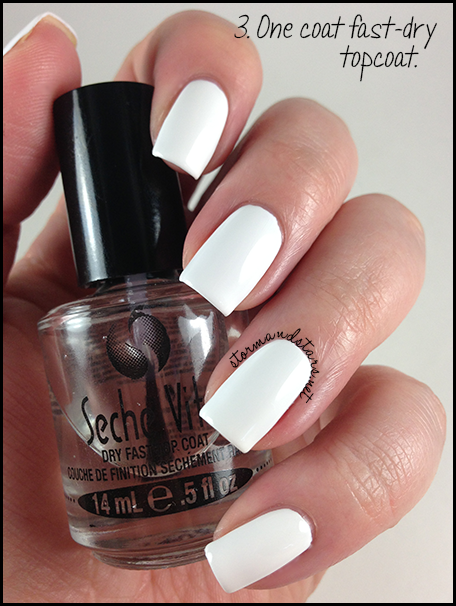 I prefer Seche Vite as it dries the fastest for me and I can start working on the rest of my manicure almost right away. 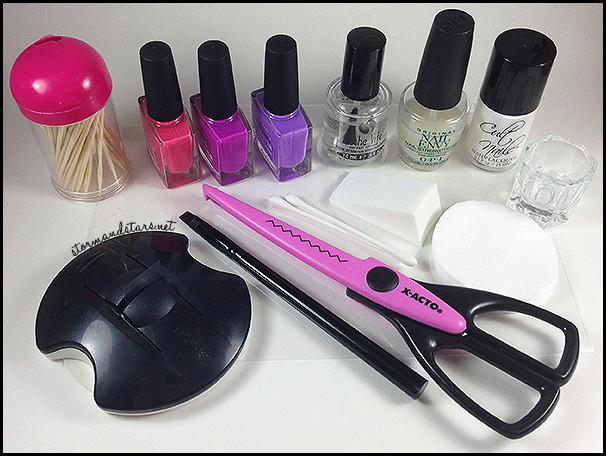 Below are the materials you will need for the next part of the tutorial, the nail art portion. The first two supplies you will need are tape (I use the pop up tape because I don't have to cut even lengths, it is already done for me.) and a pair or either zig zag craft scissors or pinking shears. 4. Cut a small piece of tape about 2 inches long. 5. 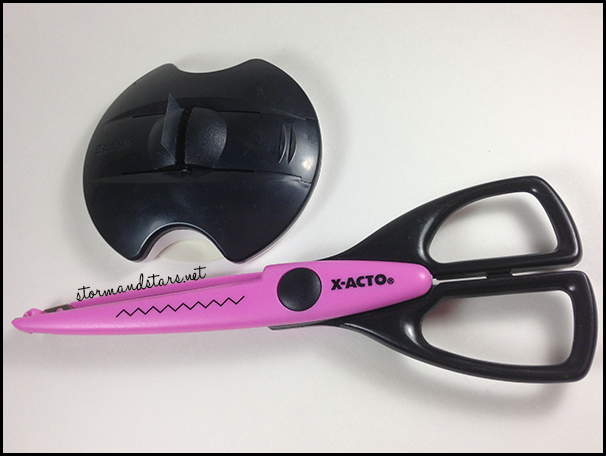 Use the craft scissors to cut off the flat edge of the tape along the long side. 6. 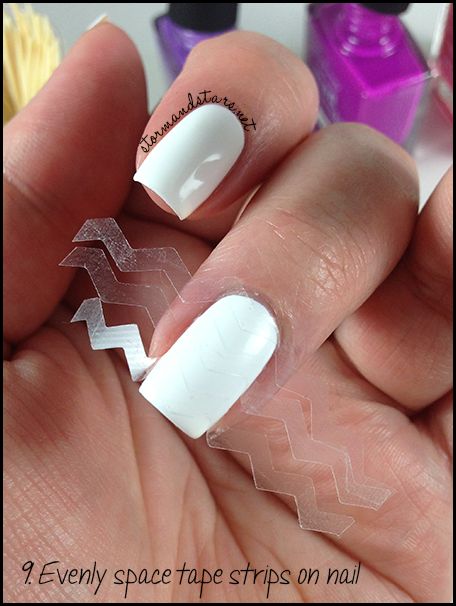 Peel the cut tape off the scissors and then place it back down so it lines up with the first zig-zag. 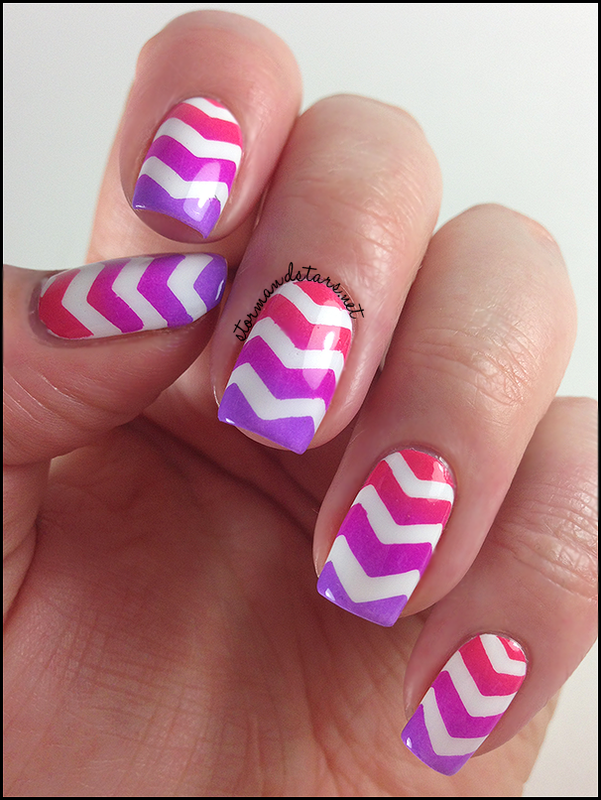 Make sure the amount of tape hanging over is the width of the stripes you want on your nails. 7. 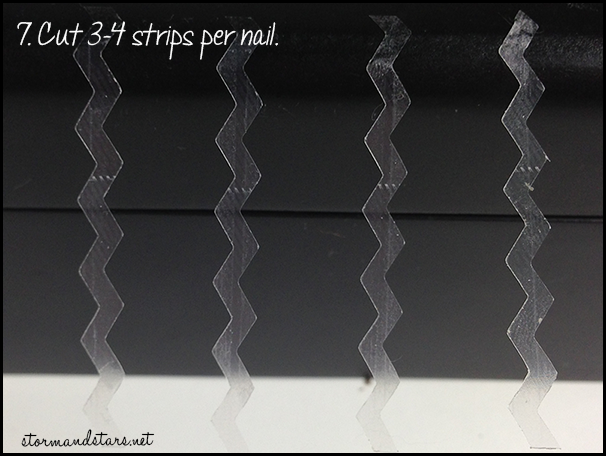 Repeat steps 4-6 until you have about 3-4 strips of tape per nail depending on the length of your nails and the width of the stripes. You may have to do more or less. 8. Open the bottles of polish for your gradient. 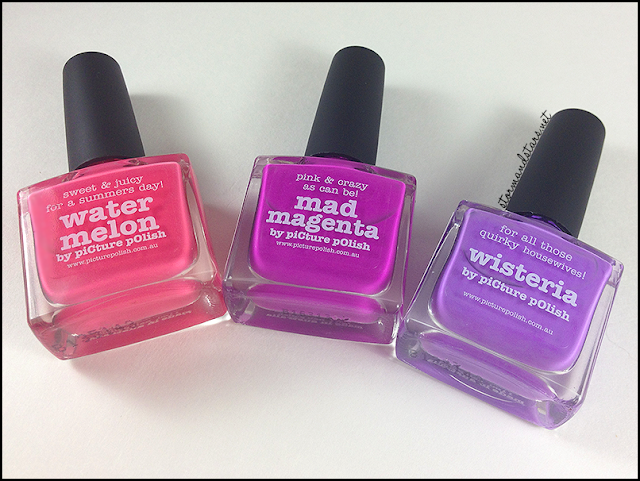 Here I have piCture pOlish Watermelon, Mad Magenta and Wisteria. 9. 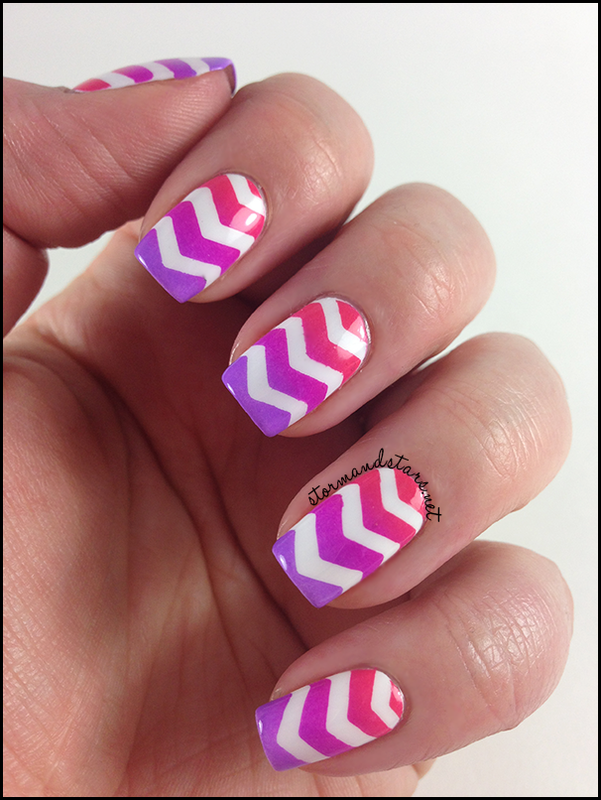 Place the strips of tape on your nail evenly spaced apart. Make sure the tape is firmly down all the way from one side to the other or the polish will get under it. 10. Working quickly, paint a stripe of each color, right next to each other, on the sheet of plastic. Use the toothpick to slightly mix along where the shades meet. I usually use one side of the toothpick for between the first two colors and then flip it for the other two colors. 11. Pick up your makeup sponge. 12. Dab your sponge lightly in a slight back and forth motion in the polish on the sheet of plastic. 13. 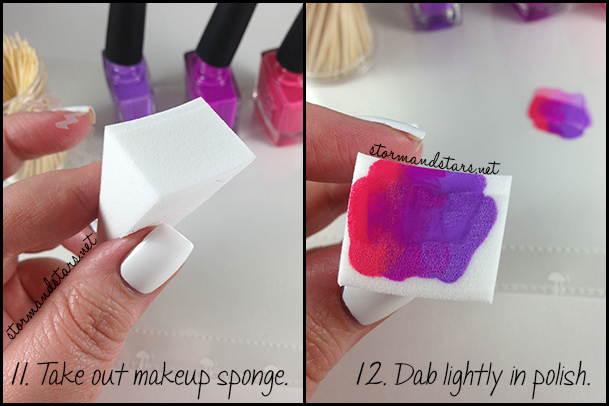 Working quickly again, dab the sponge on your nail in the same manner, moving your sponge slightly in a back and forth motion from tip to cuticle, but not too far, you want to be able to see all the colors when you are done. 14. 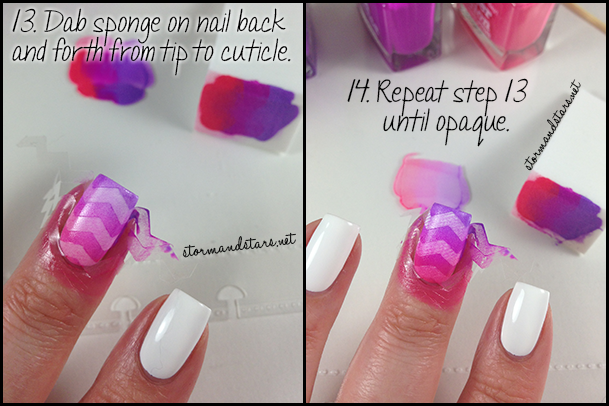 Repeat steps 12-13 until your polish is the opacity you want on your nail. You may have to repeat step 10 a couple times to get the opacity you want if the polish is sheer. 15. 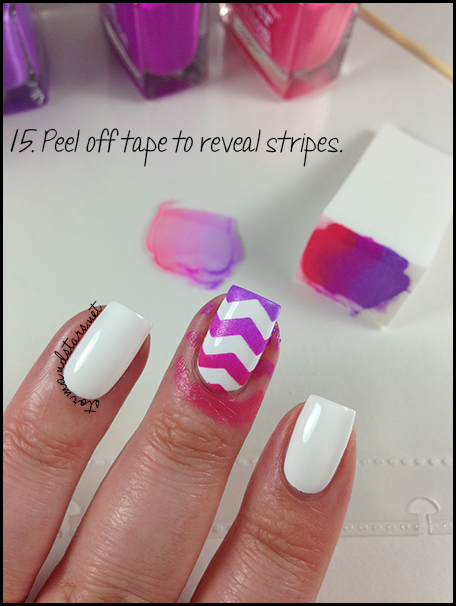 Carefully peel off the tape strips before the polish dries on your nails completely. If you are doing an entire manicure, at this point I would go back to step 9-15 for each nail on the hand before moving on. Obviously your fingers will be a mess after this, so its time for cleanup. below are my cleanup supplies. I use the small tray to protect my desk and then I have a small dish of acetone, cotton pads, an angled brush, q-tips and a small amount of lotion on my tray. 16. Dip the q-tip in the acetone and then use it to clean the large area of polish on your finger surrounding your cuticle and nail. As you can see, I don't get too close to the nail, we will get that little bit in the next step. 17. Use a small angled brush (or whatever your preferred cleanup brush is) to make a clean line around the nail art. Dip the brush in the acetone and then dab it on the cotton pads to get any excess off before carefully swiping it around your cuticle. You may have to repeat a few times to get all the polish off. 18. 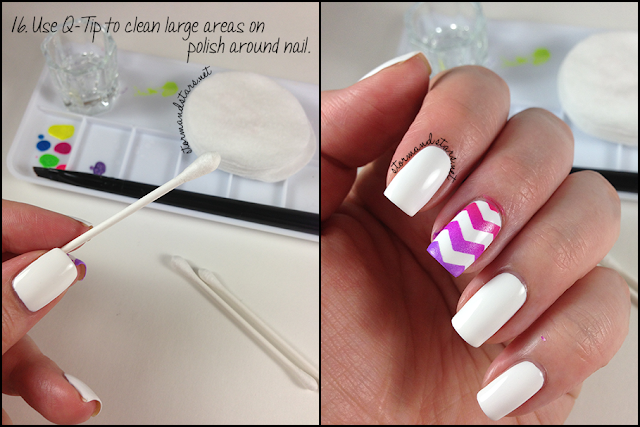 Once your nails are cleaned up and dry, carefully paint one coat of clear topcoat over the entire design on all nails. Be careful or you can smudge your design. I usually start with more topcoat than I need and kinda float it over the nail, trying not to go over one spot more than once, or push down too hard. Make sure you moisturize once the topcoat is dry and you are done! I hope you all enjoyed this tutorial! 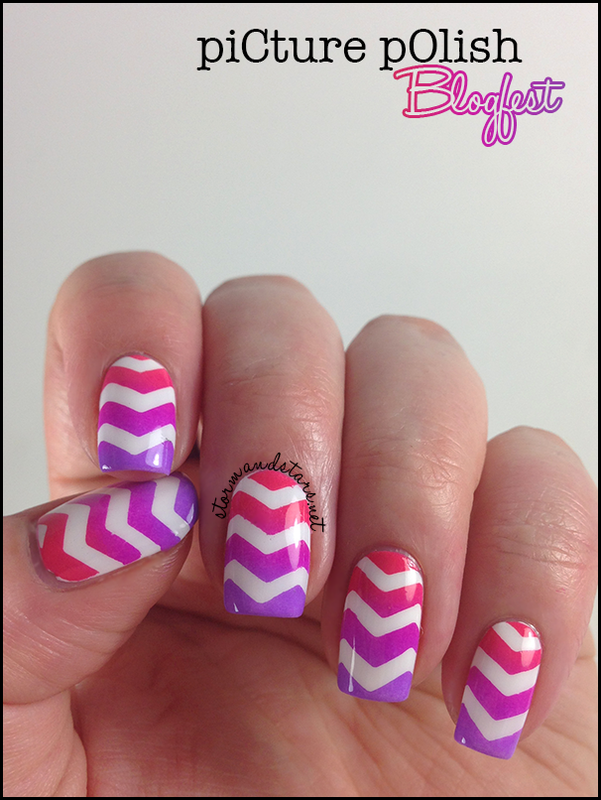 I really enjoyed making it for you and I am so glad to have been part of the piCture pOlish Blog Fest 2013! If you have any questions about this manicure or the tutorial please do not hesitate to ask me. If you didn't see it after the manicure, below are the details about piCture pOlish! Gorgeous! I love the gradient! I have to try that with other colors, too!! Thank you! I'm looking forward to trying it with other colors too! 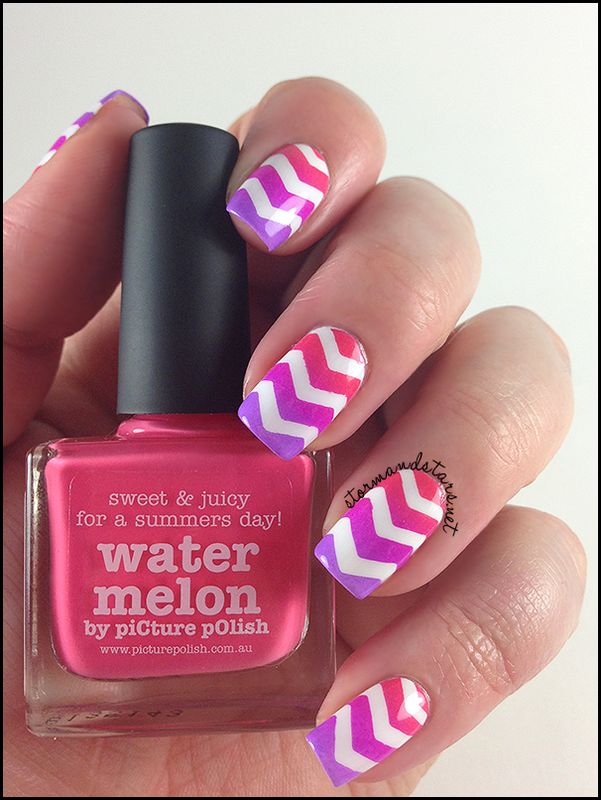 The colors you got were perfect with this design, so bright and fun! They really were, I'm so glad I got such fun, summery colors. This is so so perfect. I love it. I have never tried the tape and craft scissors technique, but after seeing this, I am going to have to!! Great work! Thank you so much! The craft scissors are kinda a pain to work with, but the end result is totally worth it. what a great post! 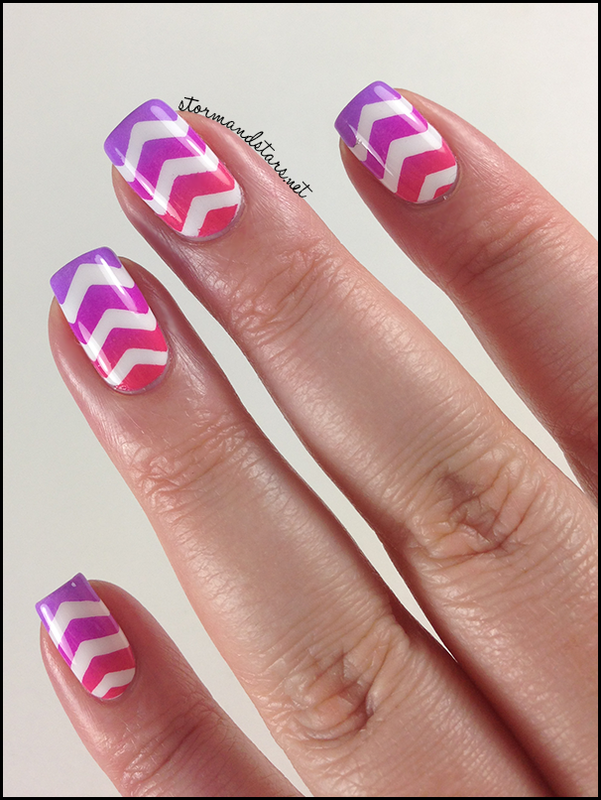 the tutorial is very helpful, and i love the chevron design *and* the colors you chose! Thank you! Nail Envy is my secret, two coats under every mani. I rarely get staining. Thanks! Haha, I almost didn't use that one because I thought it looked awkward, but I liked it anyway! Absolutely love this manicure!!! You got great colors! Thank you! I lucked out in the color department for sure! This gradient is so freaking hot. And I really like that you made the extra effort to do the zigzags - it sets the whole thing off. Also really jealous of your perfect naked nails. Well thank you very much for the super kind words! I really can't take credit for the nails, I don't do anything really special, Nail Envy, lotion EVERY TIME I get my hands wet and uh genetics? Thank you though!! Stunning! I love the idea of making a gradient (those colors were perfect together) with a twist. 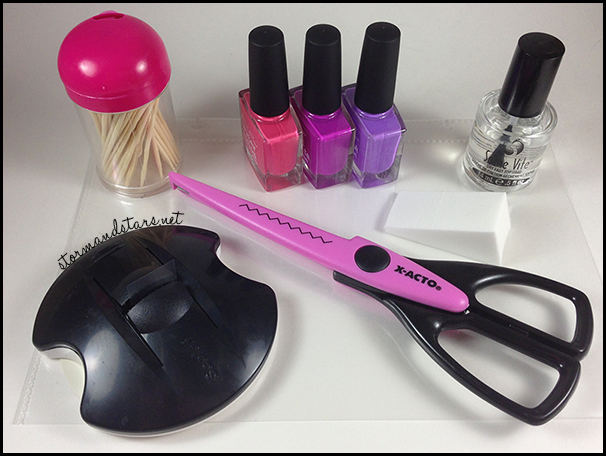 Your manicure is perfect and makes me wanna try using my craft scissors (hoping I don't mess up everything)! Hi! It's really nice that you did, I love it. 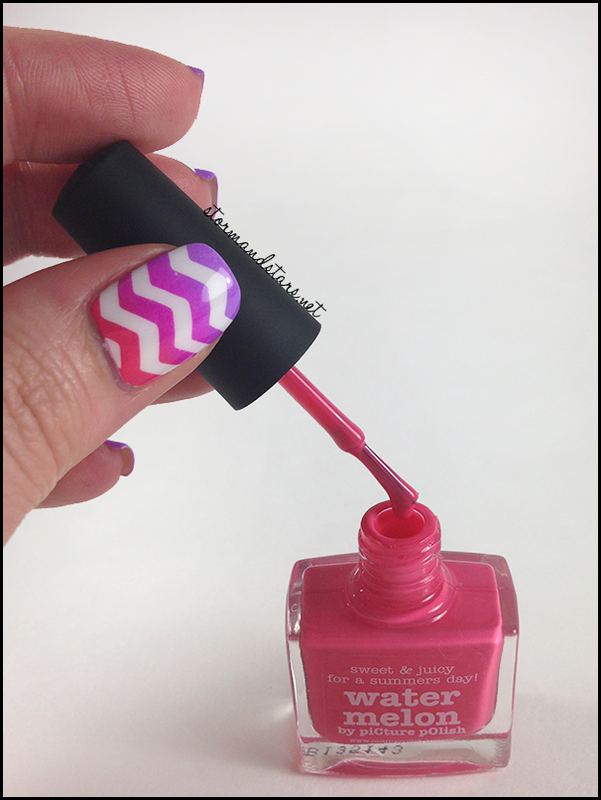 Basic I love pink and triangles, so of course I can not but love this nail art. But your photos are taken, clear, luminueuses and pretty, super tutorial well done, your nails are nice and big, I'm in love! Congratulations! Thank you for this tutorial, it is really clear! Polished By KPT - Round 2! Jaded Nail Co - Monsters and Ice Cream!